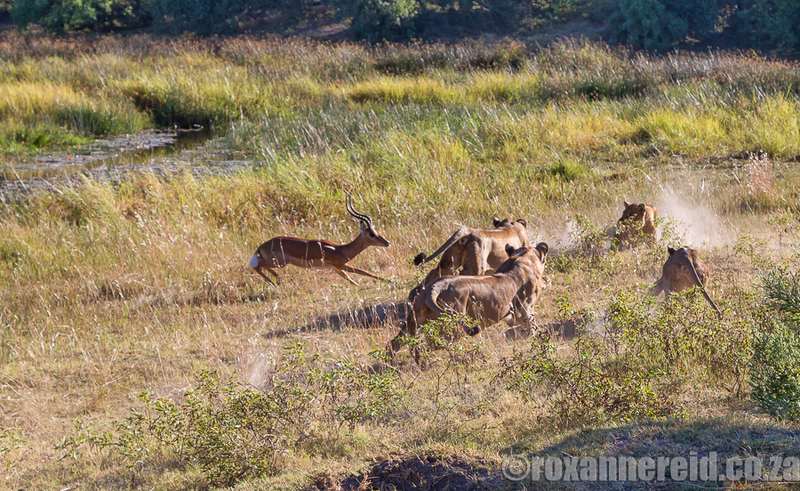 On our first game drive from DumaTau Camp in the Linyanti, Botswana, we saw wild dogs and a leopard. We were beyond chuffed. We teased our guide that he’d never equal or better that on our next drive. But nature had other ideas, showing us the raw power of lions. Just outside camp in the early morning light, Wilderness Safaris guide Evans Keowetse picked up leopard tracks on an elephant path and drove off-road to see if he could find the elusive cat. It became a bit of a habit: that morning he found five different sets of leopard tracks. Each time they meant a bush-whacking detour, especially if he heard birds giving an alarm call in the bushes. He was nothing if not determined. But we found no leopards. 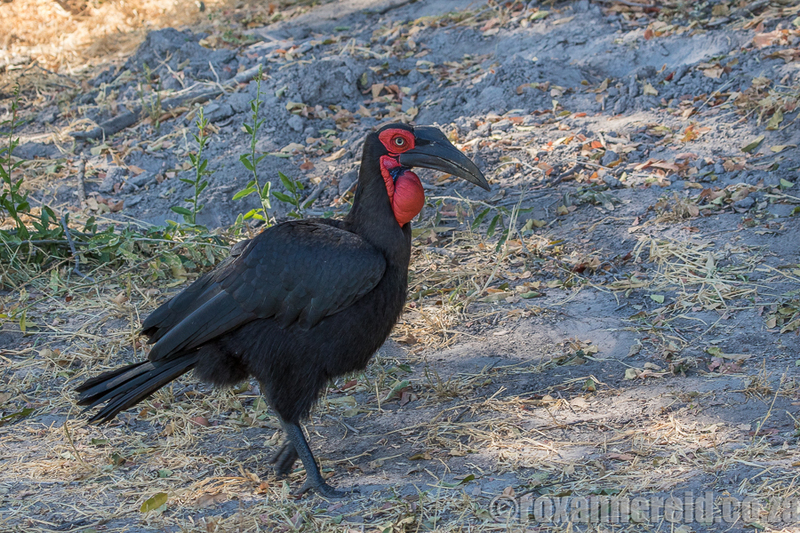 The female ground hornbill has a dark bluish spot in the centre of her throat. He talked about some of the local trees, like Kalahari apple-leaf, jackalberry and African mangosteen. We learnt that locals use the blue bush or Kalahari star apple as a toothbrush. ‘You dig up the root and chew it, then use it like a toothbrush, but it gives you an orange tongue. People that go to cattle posts still use them,’ he said. 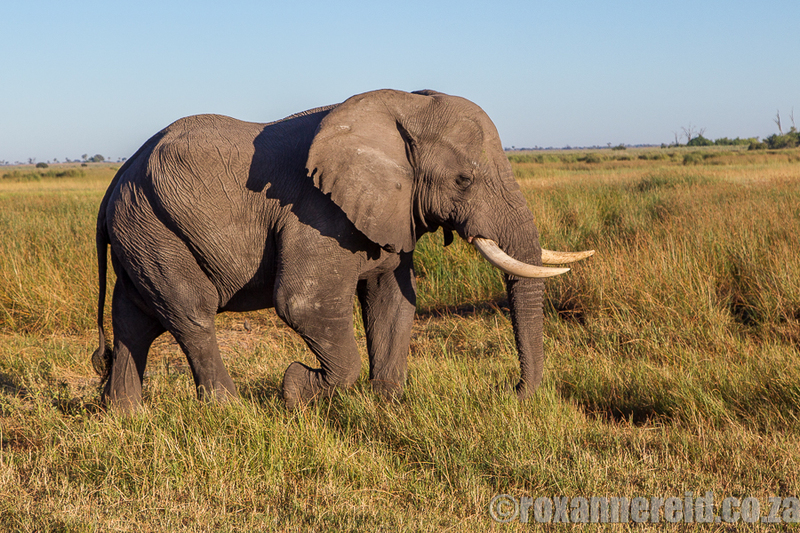 An elephant on the open floodplains. A big elephant bull in musth waggled his ears to let us know he’d seen us and we shouldn’t come any closer. A troop of baboons was foraging nearby and a startled youngster screamed at us and jumped on to its mother’s back. Red lechwe walked through the water among the water lilies. A fish-eagle called out and the wind rattled the reeds as we watched elephants crossing towards palm trees lined up along the horizon. This was the mysterious Savuti Channel, which has a history of disappearing and reappearing. It was dry for nearly 30 years before it started flowing again in 2008. Now it’s drying up once more. The word Savute means ‘unpredictable’ and its rabbit-in-a-hat trick has to do with tectonic movement of rock plates below the surface. 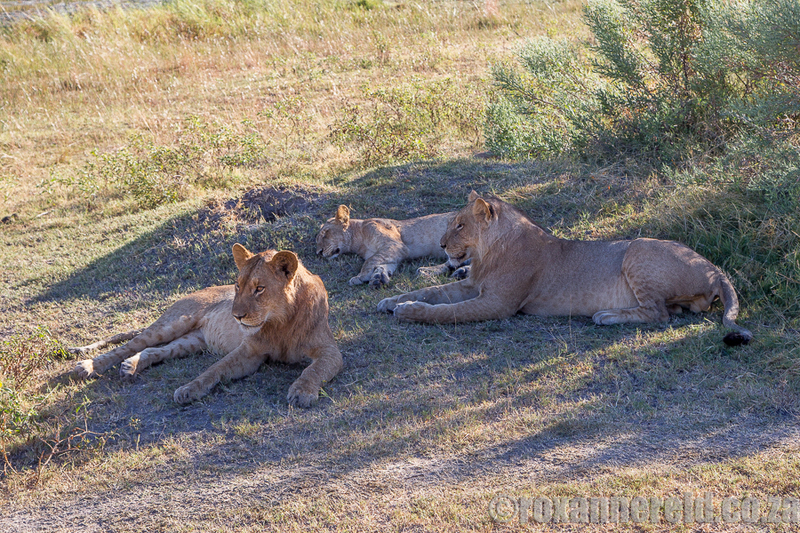 We crossed a rustic log-bridge over the water and found six lions lying down next to a termite mound. Some young males were just starting to grow their manes. Two seemed half alert, lying like sphinxes, their heads erect but eyelids drooping. We were settling in to enjoy watching them doze when a hapless impala ram wandered out of a thicket without noticing them. So pumped up on testosterone was he in this rutting season that he wasn’t concentrating on possible dangers around him – and he walked bang into trouble. The first lion spots the impala. 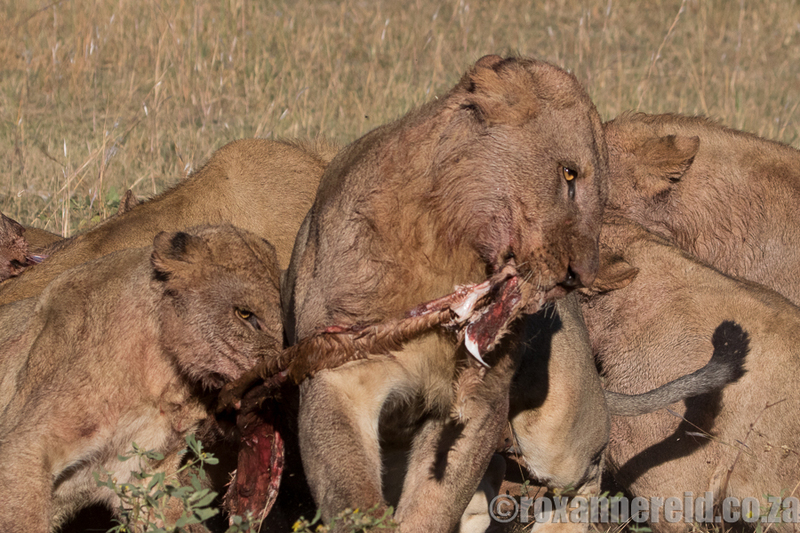 Although their tummies looked quite full, this was a chance the lions weren’t going to pass up. Sphinx Number 1 started the charge and the others joined in, fanning out in a pincer movement to cut off the impala’s escape. More lions appeared from behind us where we hadn’t seen them. The lions launch their attack. 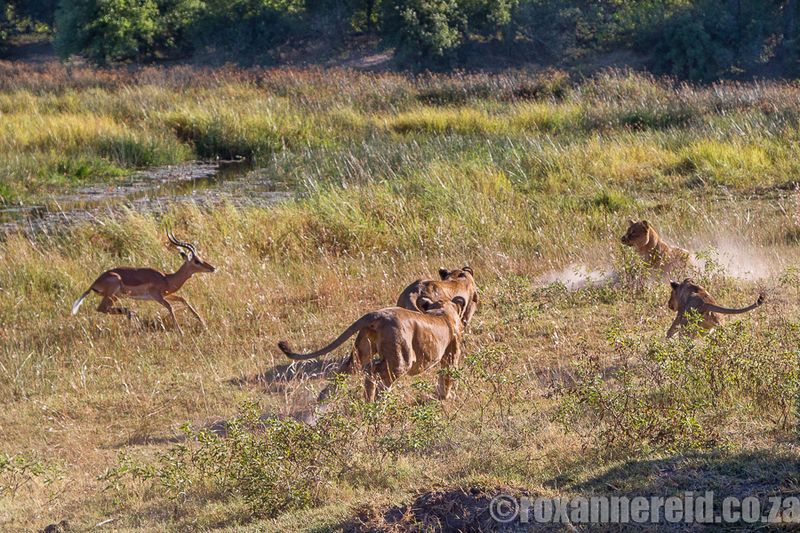 Briefly there was the sound of the impala in distress, then just the sound of lions growling and cursing at each other, blood on their mouths and faces. They clustered around, fighting for their share of the snack. 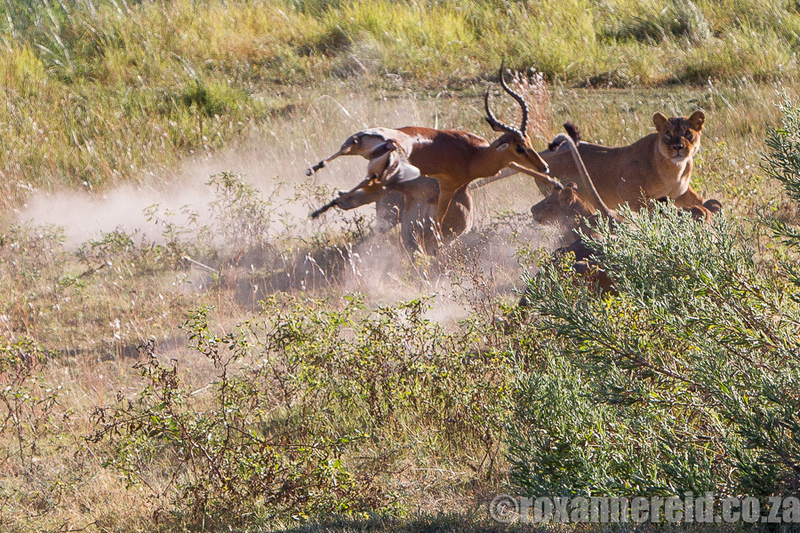 A 60-70kg impala doesn’t go far with 14 lion mouths to feed. 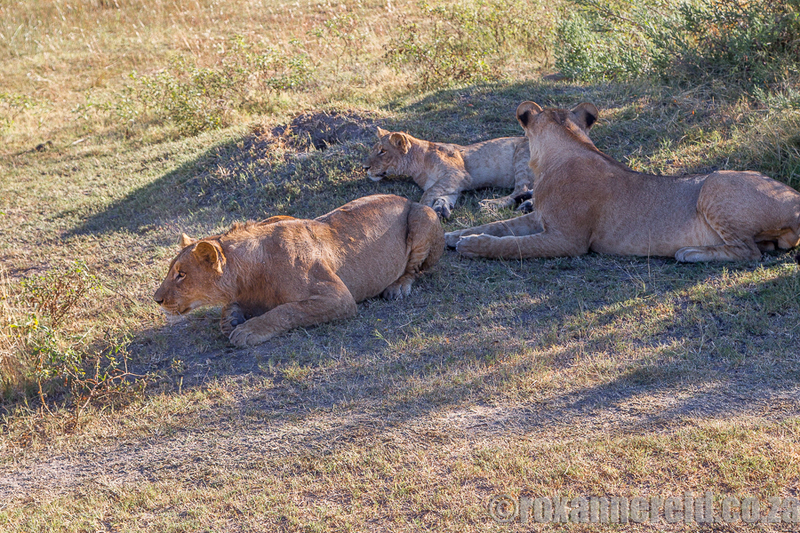 Eventually a lioness pulled off a leg and moved to a tuft of grass about six metres away to enjoy it in peace. Two others snatched a bit and walked off too. The smallest cub came towards us tripping over the stomach as it spilt its grassy contents on to the ground. 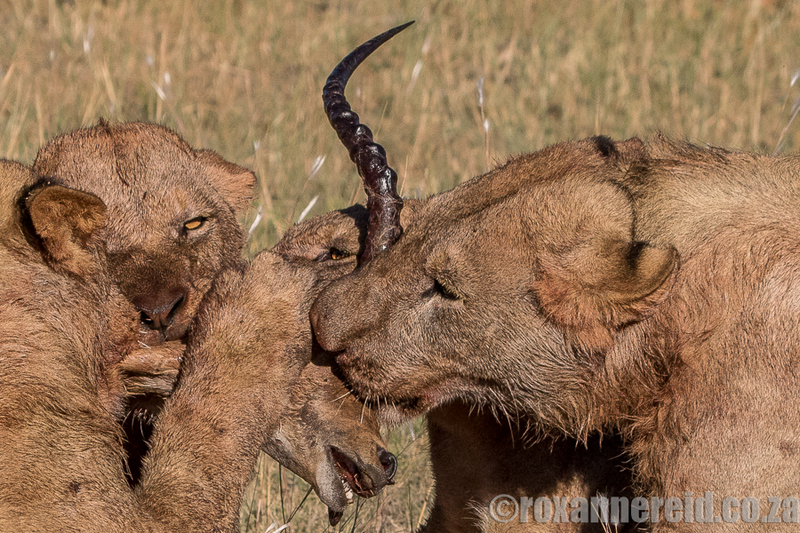 In the background two lions engaged in a tug of war, their faces covered in blood, spittle dripping on to the ground. If they’d hoped the piece they were tussling over would tear in half, they were out of luck. They had to settle again at each end of it, the sound of bones crunching. The whole impala was gone in 10-15 minutes, from a living breathing animal to nothing but bones for the vultures to pick over. Electrifying though it was to see the raw power of lions in action, it was distressing to witness how fast the transition from life to death is for prey animals. To relieve some of our held-in tension we stopped at a waterhole for coffee and a recap of the events that had moved so quickly we’d each noticed only part of the initial drama as it unfolded. But first Evans drove carefully around the area to check there were no dangerous predators in the bushes. We weren’t going to make the same mistake as that impala. Note: Roxanne Reid was a guest of Wilderness Safaris DumaTau Camp for two nights, but the opinions expressed are her own. Copyright © Roxanne Reid – No words or photographs may be used without permission from roxannereid.co.za. 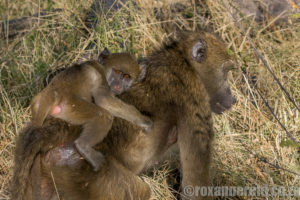 Read more from Roxanne on her African travel blog. Fantastic experience Roxanne – gotta get me into the bush! Wonderful! You really captured that moment. We’ll never forget it. You were also the only one who remembered to take pictures of the actual moment. Haha – yeah, remembering to take snaps during an experience like that is quite a feat!